This guide was specifically designed to help you recover from your procedure in a timely manner, as well as sustain good jaw health. Jaw stretching, strengthening activities and proper diet and nutrition are necessary daily activities that are required for your successful recovery. The easy and effective activities in this guide will help you relieve discomfort and swelling as well as increase your range of motion. Warning: This is a general guide, with broad information that could be dangerous to you. Please consult your doctor and therapist before performing any therapy described here or otherwise. You may want to continue the stretching activities long after you have healed to maintain full range of motion. As always, employing correct posture and position throughout your life will help you ensure a fully functional jaw. Be careful to avoid sharp pain and muscle guarding. If you feel sharp pain discontinue what you are doing and take a short break. Try pain relievers, heat or cold. If the pain does not stop, contact you doctor. Muscles guarding is the feeling that your muscles are stressed and won't relax. This works against your rehabilitation. Moist heat can help relax muscles. Or try doing your exercises 30minutes after taking pain medication. Five subsections below go into more detail on recovery: Diet and Nutrition, Posture, Do's and Dont's, Pain, and Rehabilitation. Avoid: biting and pulling with your front teeth; chewy or hard foods like french bread, steak, gum, and candy; and caffeine. The application of heat prior to stretching may relax muscles in preparation for your rehabilitation. After rehabilitation exercises and stretching, an ice treatment may reduce swelling and soreness. The goal of your rehabilitation is to recover function as soon as possible. While each patient will vary, a good goal for your mouth opening is 35-40 mm. After your procedure you may be referred to a physical therapist to increase oral range of motion and function and for exercise instruction. You may also be sent home with a rehabilitation device such as the TheraPacer™ continuous passive motion unit, or the OraStretch Press Jaw Exerciser. Special devices like these may speed your recovery, reduce pain and swelling and increase your range of motion and we encourage you to work with your physical therapist while using these devices. Place the top of your tongue on the roof of your mouth and open as wide as possible. 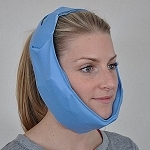 Stretch jaw open by utilizing the TheraBite device or Pacer CPM.